Before she knew what a calorie was, Karen Kataline was allowed to have only five hundred of them. She was seven. Forced into the spotlight by her weight-obsessed mother, Kataline spent her childhood trapped in a world of pageants, performances, and perpetual hunger. In a subconscious attempt to cover herself, Kataline tells us her story of using food and weight-gain to shield herself from the eyes that roved her. 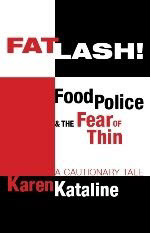 Amid heated controversy about the obesity epidemic, food regulation, and child beauty pageants, Kataline’s timely memoir offers an unprecedented look at an adult who finally came to understand how her experiences affected her. Her true story exposes the truth about food restriction and children who are put on display. Available this fall. Details here.